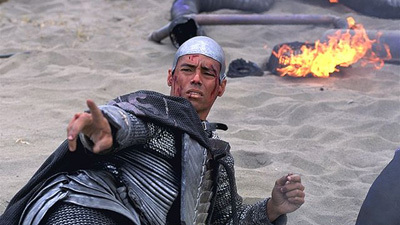 On PB5-926, the SG-1 team finds their sworn enemy, Apophis, fleeing Goa'uld death gliders. He has been tortured and is slowly dying, and he is granted sanctuary on Earth in return for information. But his information is alarming. Apophis is being pursued by an ancient and powerful Goa'uld named Sokar, who will destroy all of Earth to find him. The team's Tok'ra ally, Martouf, warns that Apophis must be returned. As Sokar attacks through the gate, Apophis dies of his injuries, and his body is returned to Sokar. But Sokar has a sarcophagus that could revive the dead. The SGC received a set of coordinates on their radio frequency which they assumed to be a message from the Tok'ra. "Cal Mah" is the Goa'uld word for sanctuary. Apophis's injuries included two broken femurs, internal bleeding, withdrawal from the sarcophagus, rapid aging, and severe damage to the symbiote from torture by the same device used by the Ashrak. The symbiote was unable to repair the damage, but a sarcophagus can revive him even from death. Sokar is a Goa'uld of ancient times. He was once ruler of the System Lords but was defeated centuries ago by an alliance of Goa'uld including Apophis and Ra. In The Book of the Dead he was the most feared deity in ancient Egypt, the original god of death, similar to Satan. At one time he ruled all of Earth, his lands around Memphis were covered by darkness and inhabited by serpents. His portion of Tuat, the Other World, was filled with lakes of fire where the wicked were thrown as punishment after torture and mutilation, as in hell. Sokar may inhabit Unas, first hosts of the Goa'uld. Sokar had captured and tortured Apophis. The last of Apophis' loyal Jaffa died helping him to escape. Sokar has a sarcophagus to revive him. He is also currently at war with Heru'ur. Sokar fired a particle accelerator at the wormhole. The space between the wormhole and the iris is enough to allow high energy subatomic particles to reintegrate, but moving at near-light velocities. Modulating the particle stream can create an image, and intense heat, up to 130 degress in the gateroom, and 6-8 times that for the iris itself. The Tok'ra had operatives aboard Sokar's vessel. They used the radioactive signature of the Sagan box to contact Earth. They were given a remote access code signaling device (GDO) to contact Earth in the future, and left behind the sub-space transmitter of the Tollan, with whom they are friends, enabling Earth to contact the Tok'ra in the future. Scribe: Shim rota! Shim rota! Reta! Reta!